Happy Thursday, I hope you've been having a great week! I'm still working on getting this unpacked from my trip to CHA, and I have some more things to share with you from some classes I took while I was there, so be sure to check back. While at CHA, I was able to spend some time with Kerry (3CT Challenge Mom), and Kristen (3CT Challenge Team Member), what fun! This week's challenge is Use at least 2 different images...words don't count. For this challenge, I created two cards, both using images from the Artisic Outpost Birds of a Feather plate. On this card, I randomly stamped images in brown onto the DSP and sponged the edges. I stamped the bird in Black Archival on Watercolor paper, masked it with Eclipse Tape, then stamped the background for a collaged look, coloring using the Marker Watercoloring Technique. The Swivel Clasp is adhered to the stamped bird cage, then to the card using dimensionals. For this second card, I randomly stamped the images on a piece of Basic Grey Origins Pattern Paper for my background. I stamped and masked the bird, then aslo stamped the bird again, cut him out, colored him, then popped him up over the first image. I added some Moss and Twigs under the image. 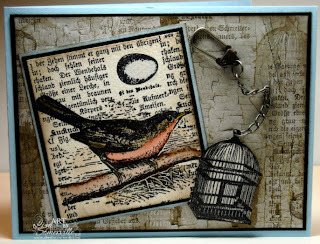 In the Sizzix Class I took at CHA, I received the really cool Caged Bird Die from the Tim Holtz Alterations Die I used on my card. First I emhossed it with the Sizzix Cheetea Embossing Folder on Chocolate card stock, then used the a Dura Sand sanding block to lightly distress the embossing. Speaking of sanding blocks, have you seen the new Sanding Twigs from Dura Sand? These little guys are awesome for getting into tight places! After sanding, I cut out the die and adhered over my image, and trimed away the excess. 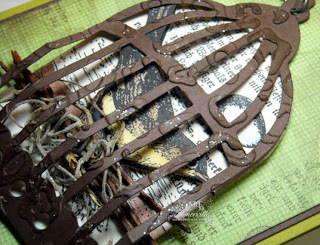 To give the cage of bit of a rustic look, I used Soft Suede Ink and the CuttleBug Highlights Technique, then once I adhered the card panels in place, I added a touch of Rock Candy Stickles to the embossed areas. Looking for more inspiration, be sure to click on the Three Clovers Challenge Logo on my sidebar to see what the Kerry and the other Challenge Designers created this week. Very cool Lisa. I love that second card. So creative. Great job. Lisa, your designs blow me away! Love the birdcage, it looks great on the card! OMG those cards are great. That bird cage is awesome. Had fun seeing you and Gerri again!! Love your work. WOW Lisa!! This is just amazing! LOVE that cage! AMAZING!! I had so much fun meeting you this past weekend! LOVE these. Both cards are wonderful. I really enjoyed palting with the KS stamps. Thanks for helping me out. Your work is amazing! 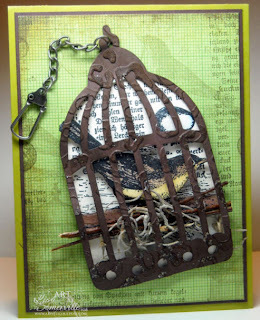 These are awesome Lisa, Love all the distressing and the textural elements. these are just beautiful, and so lucky to have that die already! Lisa, both of these cards are wonderful!!! Especially love the 2nd one with bird cage die!! so cool...I love it. I love the dimension and the creativity. This is awesome! I can't believe how realistic it is! You are goooood, woman! I'm going to add LisaSomerville.com to my bookmarks! TYFS!